Nielsen has discovered that Generation X and Generation Z – which makes up most of today’s consumer base – is willing to pay extra for products and services that come from brands who are committed to positive social and environmental impact. More than 70% of both cohorts, to be precise. Brands that establish a reputation in this area have an immense opportunity to grab market share, build loyalty, and thrive, according to Grace Farraj, SVP, Public Development & Sustainability at Nielsen. The findings show that, for those willing to spend more, personal values are more important than personal benefits (i.e. cost or convenience). Needless to say, marketers should chalk up sustainability as a crucial element in their campaigns. Linking the brand’s message with the causes that matter most to consumers will align those consumers’ demands with what the brand has to offer. Here in South-Eastern Europe, we share a similar mentality. We check every label when we stock up with supplies, and every battery that we use here in the office goes into the recycle bin at the end of its life. Caring for the only place we can call home should be considered a priority, not a burden. In fact, the very act of protecting Mother Nature comes with a warm fuzzy feeling, and we suspect it’s thit feeling that cements a customer’s faith in a brand. If we can feel it, so can our customers. 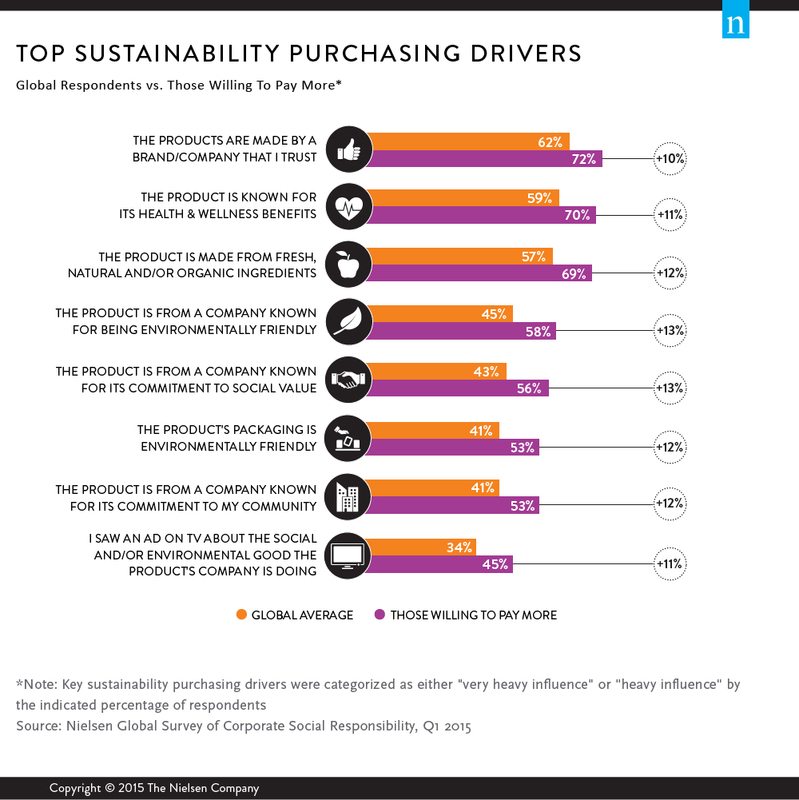 Below is a list of top sustainability purchasing drivers measured by the global average, as well as by the people willing to spend more to commit to sustainability.